LVL priority for Moren: Tactical Maneuver is the core Moren's ability. Moren's Play sample: Keep in mind Moren wants prolonged fights and, if possible, to enter exchanges while having as many Tactical Maneuver stacks up as possible. When ganking, try to come from behind the enemy, land the ultimate and follow up with Impact Barrage in order to stun him. Proceed to deal damage and with ally's help, it should be enough. 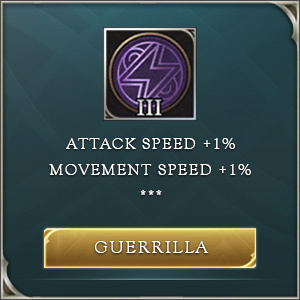 In other cases stay at max attack distance constantly spamming Tactical Maneuver while using 2nd skill and the ultimate as safety. Every successful attack and ability places a Mark of Precision on Moren. At 5 stacks, the cooldown for Tactical Maneuver is refreshed immediately and Moren gains 12-26% (1% increase per level) life steal. -This is why it is important to play aggressively as Moren. Maintaining a barrage of auto attacks and Tactical Maneuvers will grant you a significant increase in sustainability. Moren’s movement speed is increased by 40% for 1.5 seconds. His next normal attack within 5 seconds fires 2 bullets, each dealing 25 (+147% of AD) physical damage. Moren also gains 25/34/43/52/61/70 armor and magic defense for 5 seconds. These effects can be extended by successfully landing normal attacks up to 8 times. -Moren's core ability, from damage and toughness to mobility increase, all packed in one ability. It is clear why it is important to use it on cooldown. -The additional hit provided by this ability counts toward Moren's passive stacking. Moren knocks back enemies and deals 150/200/250/300/350/400 (+60% of AD) physical damage. Also reduces enemy movement speed by 30% for 2 seconds. -Knockback anyone in line who is a danger to you or your allies. Moren launches a magnetic grenade towards the target area. The explosion triggers a magnetic storm over 2.5 seconds, dealing 180/240/300 (+30% of AD) physical damage 6 times to enemies in the area and reducing their movement speed by 50%. Enemies knocked into the storm by Impact Barrage are also stunned for 1.5 seconds. -As with other AoE slowing effects, this one can also create openings for your team to follow up with skill shots and demolish those caught within the 50% slow of Magnetic Storm. -One vs One. Strong in this department thanks to the combination of Precision, his passive, and Tactical Maneuver. Combination of life steal and armor/magic resistance buffs gives this hero great sustain and dueling power. -Kiting potential is strong with this hero. Impact Barrage knockback is relatively easy to land, combined with Magnetic Storm for an additional 1.5-sec stun and 50% slow. That paired with the movement speed increase from Tactical Maneuver makes this dwarf difficult to deal with, especially if you are a melee champ or lacking in the mobility department. -Team Fights. Moren being resilient can be a deterring factor, when they (the enemy team) decide who to focus in team fights. However, if you get focused, being prepared to use knockback and Magnetic Storm is mandatory, while also aggressively using Tactical Maneuver and auto attacking. "Damned if they engage you, damned if they don't! "- is the goal here. -Being stunned or in other ways auto attack disabled, Moren loses even more than other Marksman heroes, as his toughness kicks in only after a few auto attacks. For the same reason, he is vulnerable to burst dmg early in the fight. -If you fall behind in gear or levels, it is extremely difficult to have a positive impact on team fights, or in duels for that matter. Aggressive gameplay needed in order to get everything out of Tactical Maneuver and Precision is not an option, as it would put you in a high-risk low-reward situation. Focus on Tactical Maneuver as your core ability and level it up first. Impact Barrage is there just for knockback, so feel free to keep it on a low priority in leveling. Magnetic Storm should be taken immediately as it is a great team fighting tool. Magnetic Storm >>> Tactical Maneuver >>> Impact Barrage. If you can get away with equal exchanges in the lane, take them and then rely on your passive for getting your health back up. Keep in mind Moren wants to have prolonged fights and, if possible, to enter exchanges while having as many Tactical Maneuver stacks up as possible. Getting kills is not a must, because having an opponent return to base is enough and you should be happy with those. If you grabbed the Punish talent, make sure that in the downtime you clear the jungle camps in order to gain additional XP and gold, as well as the option to life steal instead of returning to base and losing valuable time. If you are a jungler, keep in mind you can be an effective ganker even at level 2, coming from behind in a lane and using Impact Barrage to push the target toward your turret or in range of a teammate. Note that Impact Barrage can be used on jungle minions, but don't let those hit you too much. Use it when your hp goes under 90%. Moren is played a little bit more aggressive than other Marksmen due to the range and defensive options in form of a stacking buff for armor and magic resistance maintained by the continual usage of Tactical Maneuver. Ultimate can be used to help contain enemies, and Impact Barrage for saving squishy range champions from persistent melee bruising. Engaging in pincer movement can enable you to send the unsuspecting enemy into the hands of your warriors and control mages. Although this sounds cool, it is also a very dangerous move, as you can be easily singled out and dealt with.